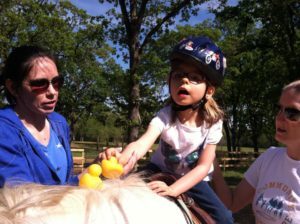 Unbridled Horse Therapy is a non-profit (501c3) that provides equine therapy for kids and adults with various Special Needs and Disabilities. Our Mission is to effectively intercede and encourage unrealized potential through the connection between horse and rider. During our sessions at Unbridled each client is matched with a personal instructor and horse and are guided through a series of research based steps that help to stimulate healing of cognitive delay, engage the core muscle groups, develop speech and improve coordination, rhythm and balance. 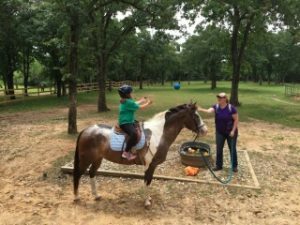 With the use of therapeutic games and programs, we are able to mold each therapy session to what the rider’s needs and various therapy/life goals are. Certified instructors with cumulative of 10 years’ experience in equine therapy. We encourage our parents to be an active participant in each session. 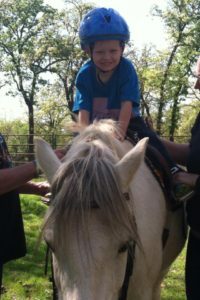 Each client is provided a one-on-one instructor and therapy horse. Our clients tack and un-tack their horse. We feel this is a vital role in their therapy, providing sequencing skills, independence and personal responsibility. We provide flexible scheduling to meet the needs of your families’ weekly schedule. Our instructors and therapy horses will be providing therapy all year long. tacking and untacking the horse, and different horse related games to build riders balance, strength and confidence astride their horse. 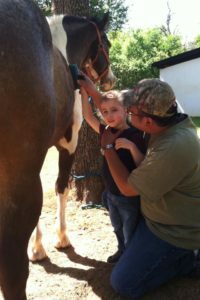 We teach our riders the parts of the horse, parts of the tack and all the responsibility that goes into riding and caring for a horse. Riders will advance in time to be able to ride their horse off lead-line, trot in the round pen and eventually be able to do all horse related activities on their own. 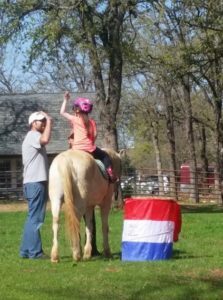 If you have any questions regarding our program please email us at shelly@unbrildedhorsetherapy.com or call (469) 319-2599.